New York State Thruway (I-87) to Exit 19 (Kingston). Follow Route 28 West for 25 Miles. Exit Route 28 on right just after the first Phoenicia town designation sign. Drive down the ramp, which leads directly to Bridge Street, go over the bridge. The Town Tinker Tube Rental is painted barn red with white trim. You can't miss it! 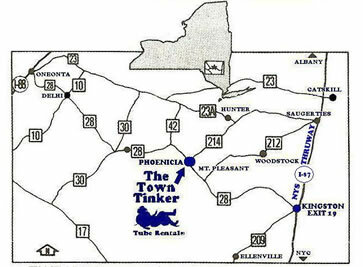 Town Tinker Headquarters is on the left and our parking lot is on the right. You are here when you see this. If in route you have any problems, stop and give us a call for further instructions.